Once, in our WhatsApp group of Multiply veterans, he said that I look effortlessly “menacing” and “intimidating”. Kinda strange to hear that from a guy whose presence radiates the aura of danger. I mean, he’s a big guy. Nearly as tall as I am (by Asian standard, that is), and he’s definitely heavier. So I decide to make a point here for my fourth day ink drawing. With his permission, I borrow his likeness for this. 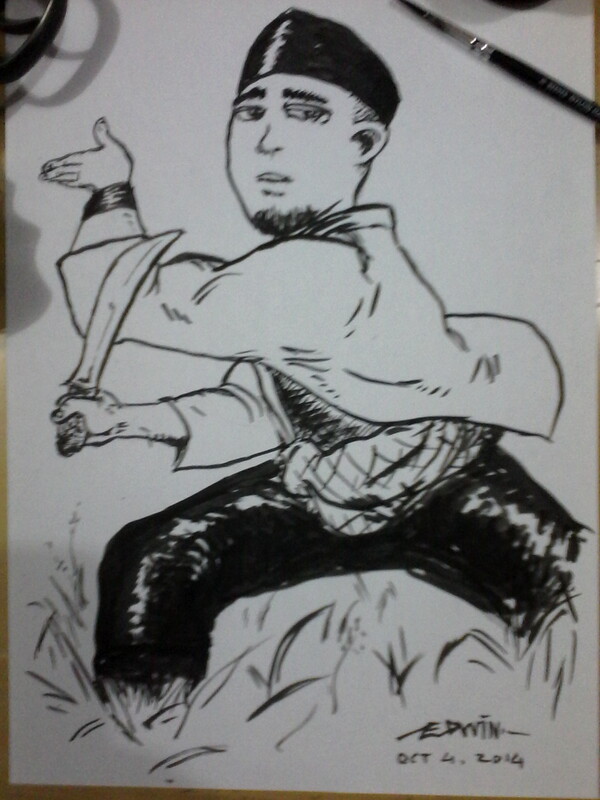 Since he draws the character Jampang regularly, I decided to draw him as that character. Yeah, that’s Jampang with a goatee. Not really in tune with the usual image of the legendary Betawi folk hero, I know, but I think that doesn’t make him look less dangerous. Now that you see him that way, tell me, which one is more menacing? Him or me? ~ by edwinlives4ever on October 4, 2014. I’m featured on Master Crow’s fourth day of Inktober, ..
ternyata berkumis, bercambang, dan bejenggot juga.